Decorative Bath Towel Sets | Collections Etc. Lace Trim Bath Towel Set - 3pc. Taking a shower or washing your hands doesn’t have to be just another part of the morning. 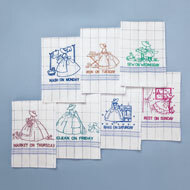 A bathroom towel set from Collections Etc. is just the way to get a little more satisfaction out of these routine activities. We design many of our own decorative bath towels and search for the best ones we can find. With our affordable prices, you can own styles for every holiday, season or style of decor. Our machine-washable cotton towels will get you dried off in a hurry. Choose a full 3-piece bath towel set with a full-size body towel, hand towel and washcloth or pick up a 2-piece set of hand towels to hang by the sink. Floral bathroom towels are always a hit year-round, and ours elevate the design, yet still have that familiar feel to them. We also offer whimsical country bath towels with woodland animals, stars, wreaths and other down-home prints for decorating your log cabin or lodge. When your favorite season rolls around, we have the right towels to set the right mood. 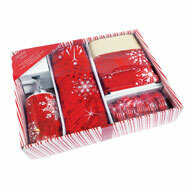 You’ll love our Christmas bathroom towel sets with snowmen, winter holly and trees for the month of December. Many of these styles also coordinate with a matching shower curtain, so look for those too! And if you’re looking for added elegance, lace-trim towels will spruce things up to impress guests. We make it easy and practical to outfit your bathroom with exclusive bath towels that add a smile to the morning.